Coaching with Colleagues has been written as a contribution to the workplace where there is a growing demand for ‘permanent learning and ‘personal development’. Coaching is now seen as a privilege for leaders of the future. Over the past decades, the discipline of coaching has matured into a true profession in its own right. It was once seen as a sign of failure for a manager to need a coach to support professional development, but this view has changed radically and coaching is now strongly associated with success. Organisations are choosing to invest in managers they regard as vital to their company and are keen to develop their abilities. At the same time, coaching has become theoretically grounded as an independent discipline within the field of organisational consulting. Coaching with Colleagues translates insights from a wide range of well-known and well-practised coaching and therapeutic approaches into clear and crisp models for practical application in modern coaching practice. The book devotes much attention to communication, internal coaching and codes of conduct, illustrated with vivid examples. It is a rigorous yet accessible guide to coaching approaches and practice. The discipline of coaching may appear fashionable but it has a long history behind it. Inspiring coaching conversations have been passed down from classical times, in the dialogues of Plato and in Seneca’s letters to Lucilius. The first coach appears in Homer’s Odyssey, where the goddess Pallas Athena assumes the form of Mentor in order to assist adventurous mortals. Coaching with Colleagues seeks to create this same inspiration at the heart of the professional workplace. explore the limits of their own effectiveness as coaches. 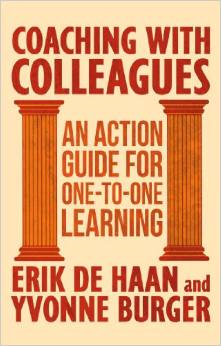 This makes Coaching with Colleagues a book for all professionals who want both to assist their colleagues in one-to-one learning and to ensure that they take better care of themselves. The working methods presented here, used frequently by the authors and their colleagues, are wide-ranging and derive from a well-established tradition. 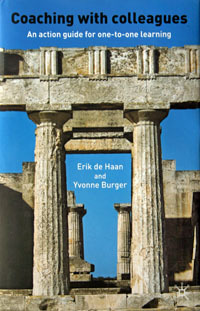 Coaching with Colleagues has been translated from the Dutch edition. The principles of this book have been tried and tested in the education and accreditation of organisational coaches, in both the Netherlands and the U.K.